Rabbi Moshe Cordovero was one of the greatest Kabbalists. He was born in 5282 (1522) in Ottoman Turkish Safed (Israel), the city that was soon to become famed as a center of Kabbalah. At a young age, he already gained a reputation as an extroardinary genius. Besides his knowledge in Kabbalah, he was a Talmudic scholar and philosopher of the highest rank, and was widely respected in these fields. He was a beloved disciple of Rabbi Yosef Caro who in his collected Responsa included two by Rabbi Cordovero, commenting on one of them. This judge has penetrated to the depths of the law. He was also one of the four people to receive the special semicha-ordination from Rabbi Yaakov Beirav in 1538 CE. Rabbi Cordovero's first book was Ohr Yakar (The Precious Light), his magnun opus, a voluminous commentary on the Zohar. It remained unpublished for four hundred years. Publication of this multi-volume work was finally begun in 1962 and completed in 1989. 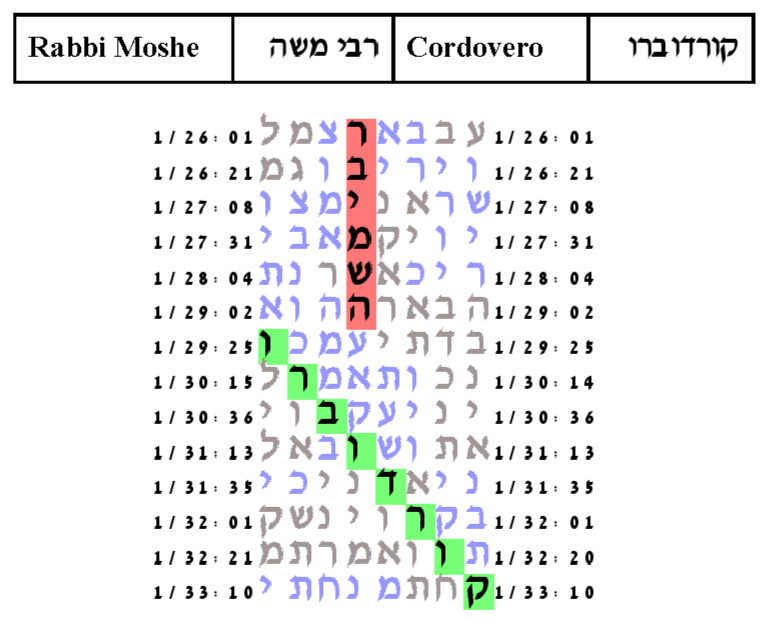 The second, Pardes Rimonim (Orchard of Pomengranates), was a systemization of all Kabbalistic thought up to that time. One of his most popular works is Tomer Devorah (The Palm Tree of Deborah), which describes how each person may imitate the Creator in his/her daily life. The Or Neerav (Sweet Light) explains the necessity of studying Kabbalah. He died on the 23th Tammuz, 5330 (1570). At his funeral the Holy Ari observed a pillar of light and his revered rebbe, Rabbi Yosef Caro exclaimed, Here lies the Ark of the Torah. The expected number of ELSs was set to 100. The cylinder size is 1097. The probability that a text from the ELS random placement text population would have as small an area table as this one is 41/10,000.